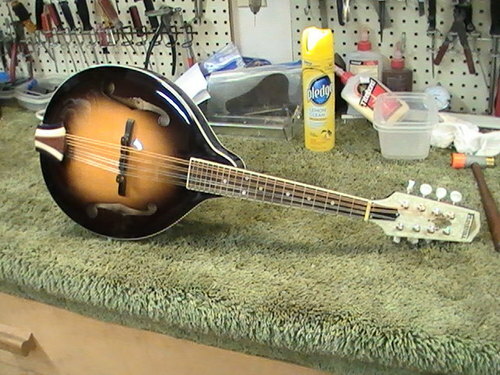 This is a brand new A style mandolin. It has been professionaly set up. Dressed frets with ebony bridge extremely well fitted to the body with very low action and easy playability. With new phos/bronze med ga. strings, it is exceptionally loud and has a very bright tone that is sure to give many years of good service. I designed and made a very cool "art deco " cover and epoxied it to the tailpiece plate. One of a kind! It comes with a soft gig bag for protection.